Canadian-American actor, comedian, filmmaker and talk show host – Tom Green visits Manila this April 13, 2019, delivering his own brand of shock comedy that will excite audiences. Green is also known for his roles in the Hollywood films Road Trip (2000), Charlie’s Angels (2000), Freddy Got Fingered (2001), Stealing Harvard (2002) and Shred (2008). What started from a cable show, Tom led his comedy and antics to MTV and the big screen. It is the actor-comedian’s first time in the Philippines and when asked about what he expects from his upcoming show in Manila, he adds, “This is my first time performing in the Philippines. My manager is actor, comedian and Saturday Night Live Star – Rob Schneider’s brother, John (that’s a mouthful) and I’ve met his mother Pilar, I think she’s from Manila … so I have a lot of Filipinos already in my life. John’s mom, Pilar is wonderful and always says she’s praying for my success. I better not disappoint. I’m looking forward to having some delicious Adobo and Lumpia and maybe a little Bibingka for desert. I hear the Filipino people love to laugh.”. Tom Green is set to perform on April 13, 2019 at The City Club, Alphaland Place, Ayala Avenue, Manila. Show starts at 8:30 PM. Tickets are at Php 3,000 (VIP) and Php 1,600 (Standard) and are available via Ticketworld. The show is part of his Asia Comedy Tour with stops in Singapore, Tokyo, Bangkok and more. 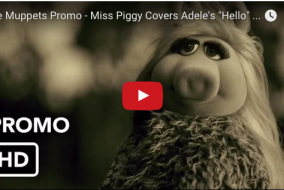 Miss Piggy Channels Adele In HILARIOUS Muppets “Hello” Parody! WATCH: darbian Beats His Own World Record for the Fastest Game of Super Mario Bros.